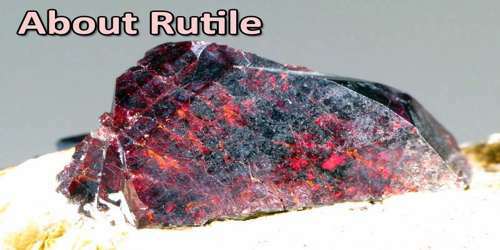 Rutile is a lustrous red, reddish-brown, or black tetragonal mineral that is an ore of titanium. It is the most common natural form of TiO2. It comes in a surprising contrast of distinct habits and colors, making it a very interesting mineral. It has multiple unique crystal forms as well as several telltale colors, styles, and associations. Rutile usually occurs as prismatic crystals in other minerals, especially as dark needlelike crystals in quartz. It is useful for the manufacture of certain optical elements, especially polarization optics, for longer visible and infrared wavelengths up to about 4.5 μm. Rutile is commercially important titanium mineral, although most titanium dioxide is produced from ilmenite. Rutile has minor uses in porcelain and glass manufacture as a colouring agent and in making some steels and copper alloys. Rutile is also used as a gem, but artificial rutile produced by the flame-fusion (Verneuil) process is superior to natural crystals for gem use. Rutile comes in several different environments, including plutonic and intrusive igneous rocks and granites, metamorphic gneiss and schists, carbonatites, regional metamorphic schists, and hydrothermal replacement deposits (including veins in alpine cavities). Also in detrital river and beach deposits. 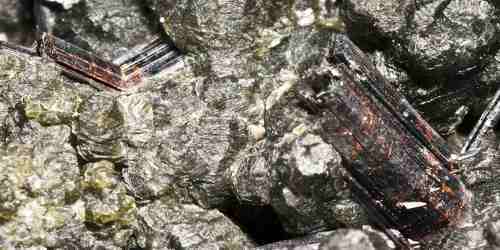 It is a common accessory mineral in high-temperature and high-pressure metamorphic rocks and in igneous rocks. The occurrence of large specimen crystals is most common in pegmatites, skarns, and granite greisens. Rutile is found as an accessory mineral in some altered igneous rocks, and in certain gneisses and schists. In groups of acicular crystals it is frequently seen penetrating quartz as in the fléches d’amour from Graubünden, Switzerland. The top rutile-producing countries include Australia, South Africa, and Ukraine. Rutile is also mined from apatite veins in the Gjerstadvatnet and Vegårshei regions of Norway. It is widespread in the Alps and, in the United States, is abundant in Magnet Cove, Arkansas; in central Virginia; and on Shooting Creek, North Carolina. The ‘original’ rutile structure is actually titanium dioxide, or TiO2, and is a mineral commonly found in metamorphic rocks. 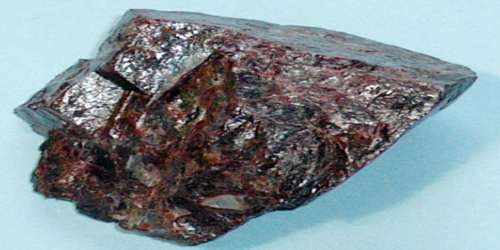 It’s a red mineral that often has white streaks in it. The white hints at one of the big uses for titanium dioxide as a white pigment, rutile is one of the main sources of the whitening part of our toothpastes! The ionic radius of the titanium(IV) ion is 0.745 Å and that of the oxide ion is 1.26 Å. The ratio of radii for the cation and anion is thus r+/r– = 0.745/1.26 = 0.591. With a radius ratio of 0.591, the cubic holes are too large (rhole/r = 0.732) to be suitable. 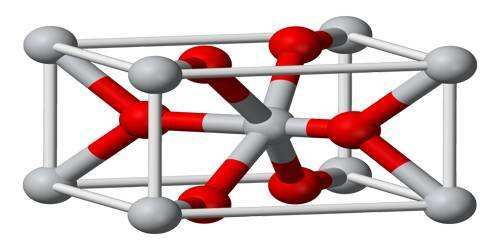 The titanium(IV) ions will prefer to occupy octahedral holes in a closest-packed structure. 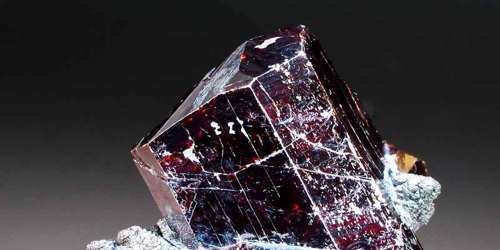 Nature chooses to pack the oxide ions in rutile in a hexagonal closest-packed structure. Rutile is well known for its habit of forming needle-like inclusions within other minerals, especially Quartz, in the form of long and slender yellow straw-like crystals. These inclusions can range from scattered needles to dense parallel fibers within a host mineral. This combination is known as Rutilated Quartz, and is used both as a collector’s mineral and gemstone. Its inclusions are also responsible for the asterism or chatoyancy effects on some gemstones, such as Star Sapphire. The thin, parallel Rutile fibers that formed within the host mineral provide these unique optical effects. Rutile is a major ore of titanium, a metal used for high tech alloys because of its light weight, high strength and resistance to corrosion. Rutile is also unwittingly of major importance to the gemstone markets. It also forms its own interesting and beautiful mineral specimens. The name Rutile is derived from the Latin “Rutilus”, in reference to a common color habit of this mineral in dark red but lustrous crystals. The main uses for rutile are the manufacture of refractory ceramic, as a pigment, and for the production of titanium metal. Finely powdered rutile is a brilliant white pigment and is used in paints, plastics, paper, foods, and other applications that call for a bright white color. Rutilated quartz is sometimes used as a semi-precious stone and/or for carvings. This stone is produced because at high temperatures and pressure, n(SiO2)-n(TiO2) is in a stable state but as temperatures cool and pressure eases the two separate with rutile crystals trapped inside the quartz crystals. Rutile, as a large band-gap semiconductor, has in recent decades been the subject of significant research towards applications as a functional oxide for applications in photocatalysis and dilute magnetism. Research efforts typically utilize small quantities of synthetic rutile rather than mineral-deposit derived materials.